Owned with Elm Creek Salers, Hebron, ND. NEBRASKA is a consistent calving ease sire who balances lighter birth weights with lots of performance, style and eye appeal. He is listed on the 2007 American Salers Assn Sire Summary as a Balanced Trait Leader. His calves are long-sided and clean made with excellent structural integrity. His first calving daughters look outstanding. They are very angular, feminine and attractive with lots of milk and well-designed udders. 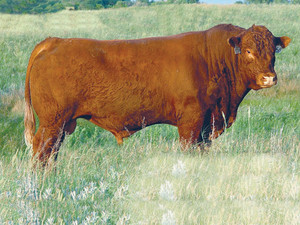 NEBRASKA’s mother is an ASA Gold Dam and one of the premier females in the Elm Creek Salers herd of Hebron, ND where he was raised. It appears that his daughters will follow in the footsteps of his great mother. Use NEBRASKA for consistent calving ease with extra performance, outstanding daughters, and to correct issues with cattle that are post-legged or straight-pasterned.